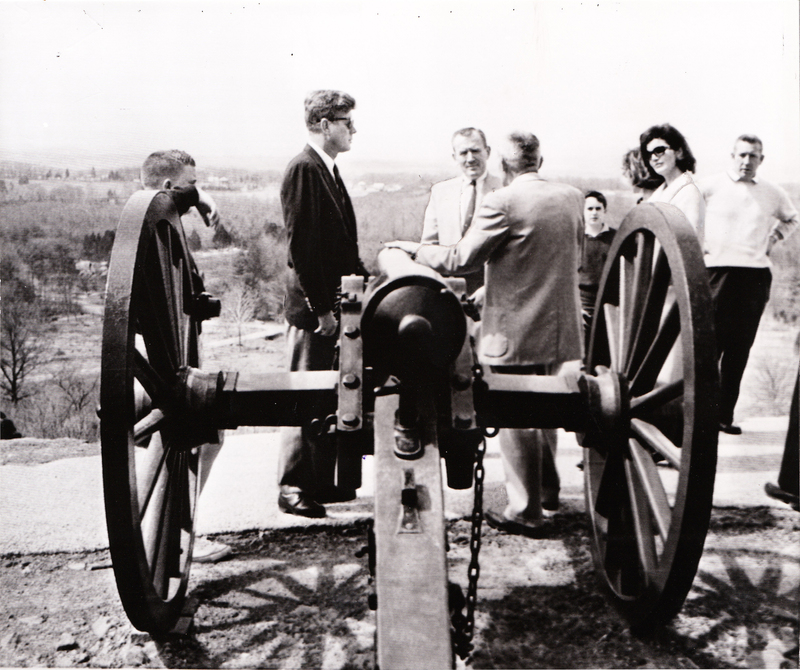 President John F. Kennedy visited Gettysburg National Military Park on Sunday, March 31, 1963. 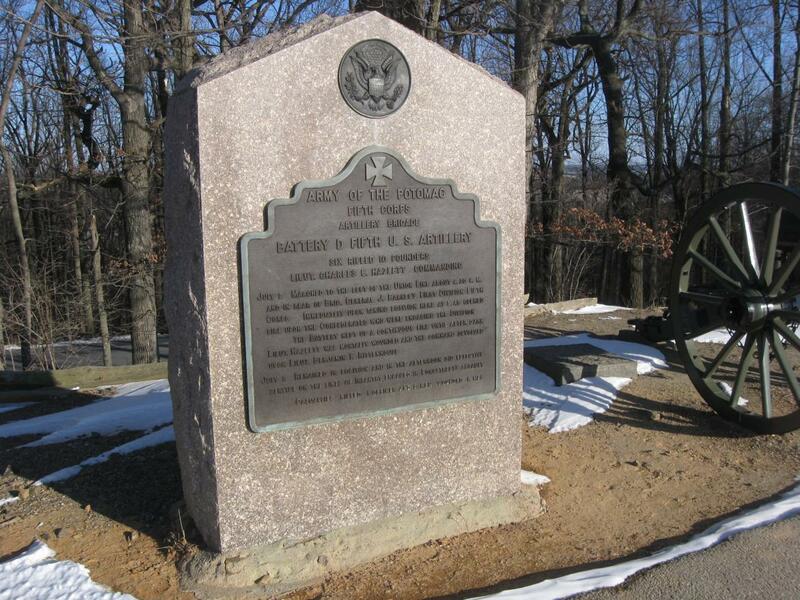 In this photograph we see the President at Hazlett’s Battery on Little Round Top. From left to right are Paul Fay III leaning on the left wheel of the cannon, President Kennedy, Under-Secretary of the Navy Paul Fay Jr., “Colonel” Jacob Sheads with his back to the camera, two unknown bystanders, Mrs. Kennedy, and another unknown bystander. 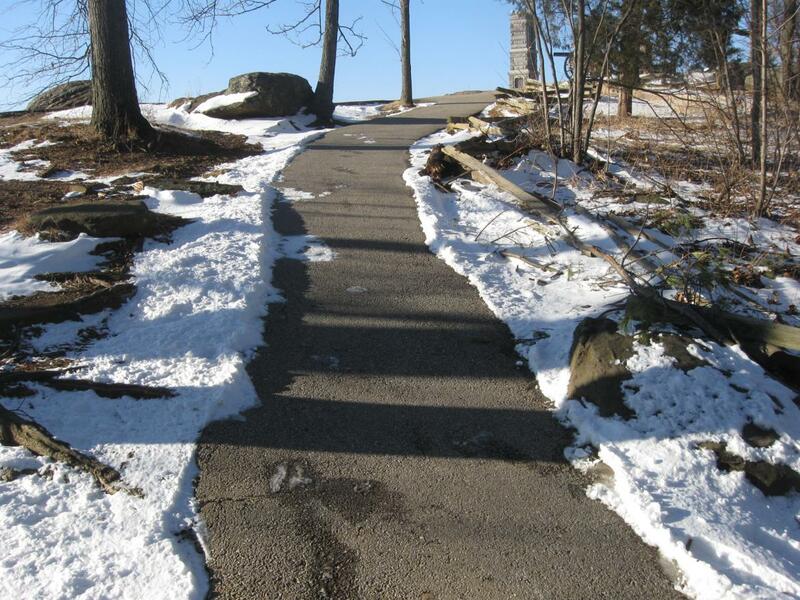 Out of sight of this picture but somewhere on Little Round Top, would have been Anita Fay (Mrs. Paul Fay Jr.), her daughter Sally, and Caroline Kennedy. They were probably entertaining themselves somewhere else on Little Round Top. 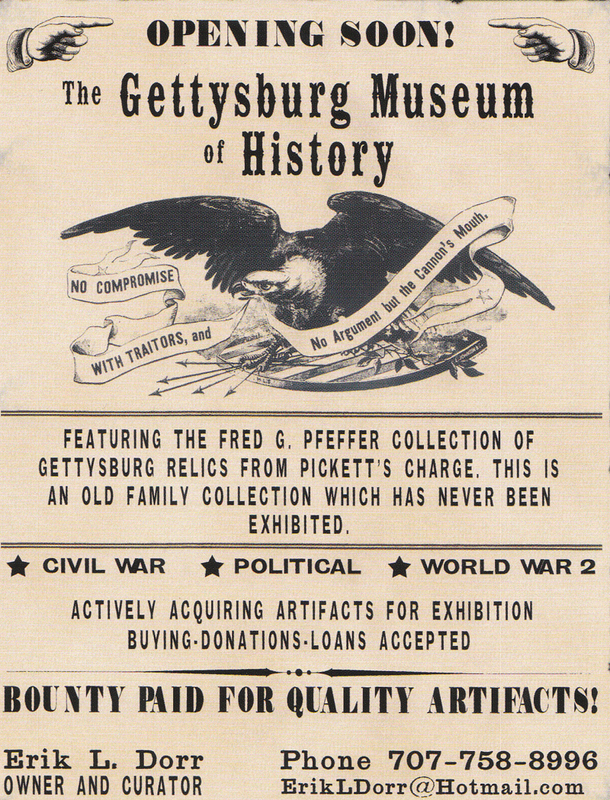 This photograph is courtesy of Erik L. Dorr, the owner and curator of The Gettysburg Museum of History. This view was taken facing west at approximately 12:10 PM on Sunday, March 31, 1963. On March 31, 1963, President John F. Kennedy with some friends and members of his family drove from a church service at Camp David, Maryland to tour the Gettysburg Battlefield. Their guide was Jacob Melchior Sheads, a longtime Gettysburg High School History Teacher and seasonal historian with the National Park Service. Licensed Battlefield Guide Richard Goedkoop follows what we know of the route that the Kennedy party took around the battlefield. In the first part of this series, Richard Goedkoop covered how the trip was planned and where President Kennedy picked up Colonel Sheads. In our second post, we discussed the Kennedy party in the area of the Angle/High Water Mark. In today’s post, “Colonel” Jacob Sheads has lost control of his planned chronological tour. “We did the whole damned thing entirely backwards,” Sheads later said. “But I couldn’t tell the President what to do.” After getting out at the “Angle,” the party traveled south towards Little Round Top. The quotes from Paul Fay come from his book, The Pleasure of His Company. 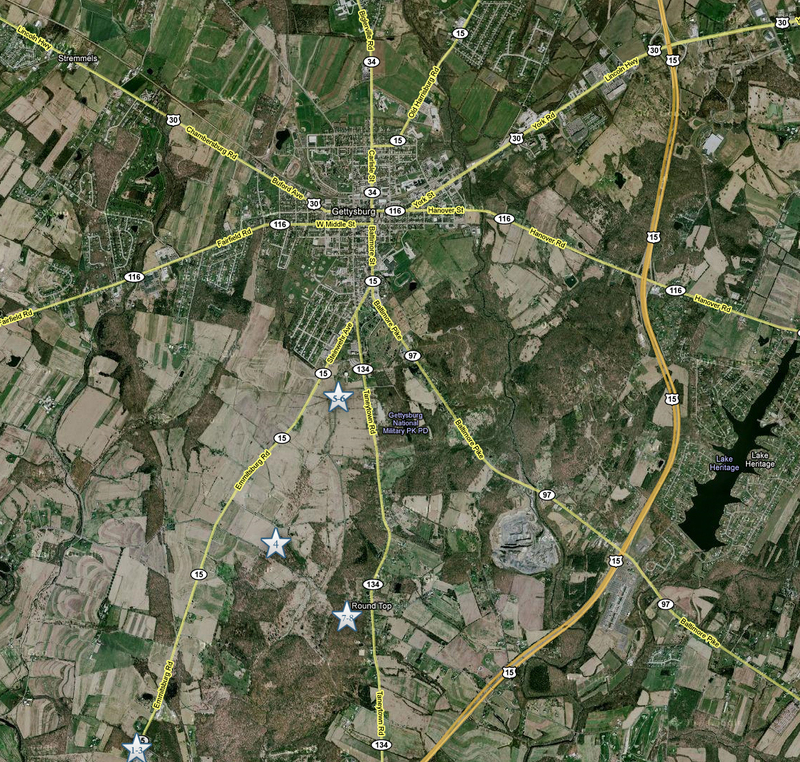 This map shows the locations of the videos that we have shot during the Kennedy segments. 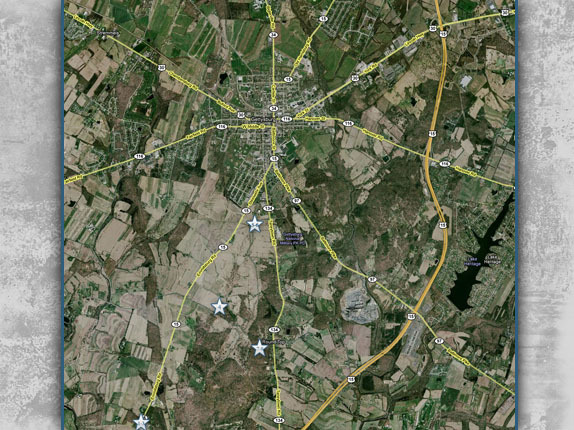 Videos 1-3 were taken at Edgewood Bowling Lanes on the Emmitsburg Road, which is off the map. Video 4 was taken at the Stony Hill or “Loop” area. Videos 5-6 were taken at the High Water Mark/Angle Area. 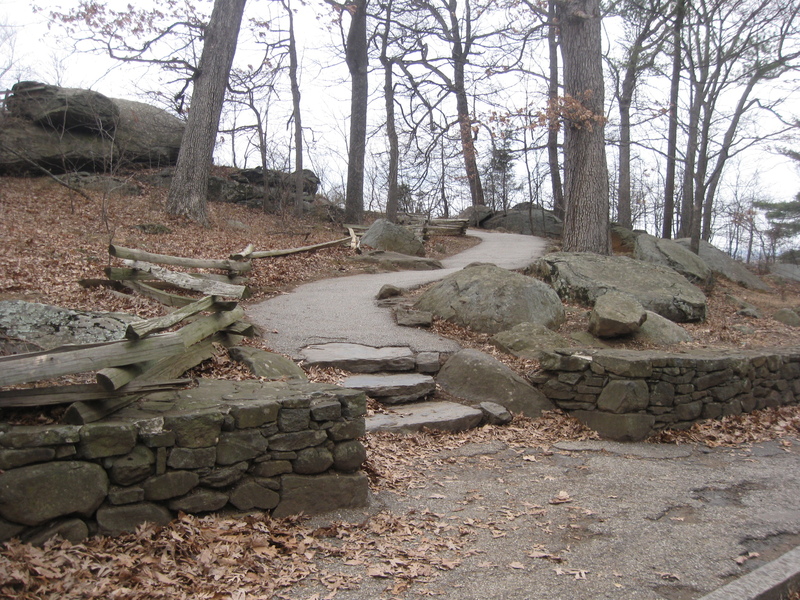 Videos 7-8 were taken on Little Round Top. This map was created facing north at approximately 6:55 PM on Tuesday, March 3, 2009. 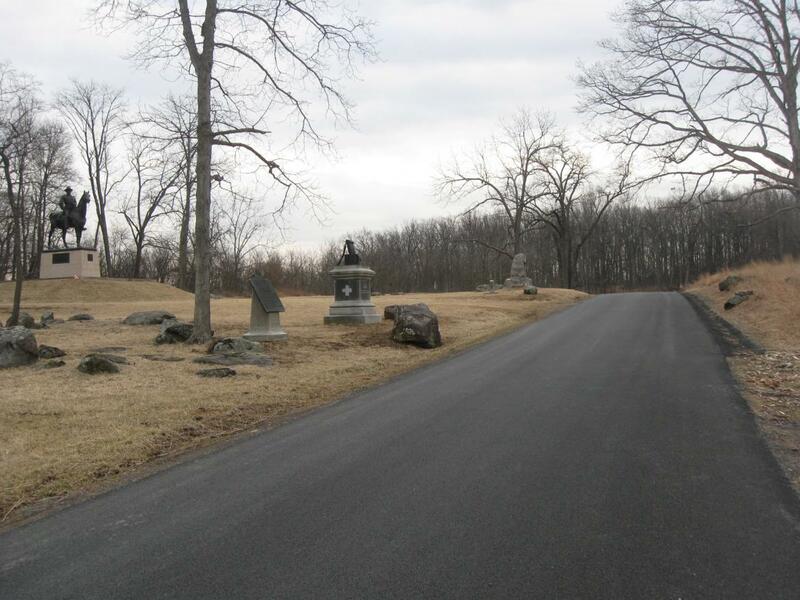 After getting out at the “Angle,” at the “High Water Mark” area, the President Kennedy began driving south on Cemetery Ridge’s Hancock Avenue. Kennedy’s thoughtful questions led Sheads to think that Kennedy had prepared for the tour. The monument to the 42nd New York (with tepee) is in the left foreground. 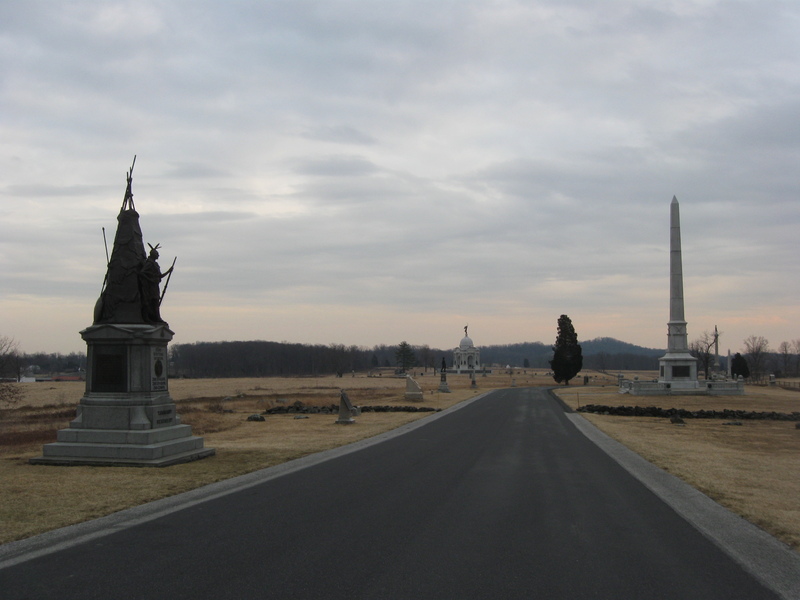 The large obelisk monument to the U.S. Army Regulars is on the right. Also on the left is the monument to the 19th Massachusetts, and the John Gibbon statue which did not exist in 1963. This view was taken facing south at approximately 4:45 PM on Thursday, February 26, 2009. In fact, Kennedy had prepared for the tour. He called his good friend and Under-Secretary of the Navy, Paul Fay on Thursday, March 28, 1963 and said that they were going to see Gettysburg on Saturday (of course they made the trip on Sunday, so either Fay’s memory was faulty, or the trip might have originally been planned for Saturday). Kennedy told “Red” Fay, “Catch up on your Civil War history so I don’t have to take you through grammar school history in front of your children. We’re not going down just to stare blankly at rocks, fences and monuments.” The 13th Vermont Monument, and the Vermont State Monument are to the front left in this view. This view was taken facing southwest at approximately 4:45 PM on Thursday, February 26, 2009. 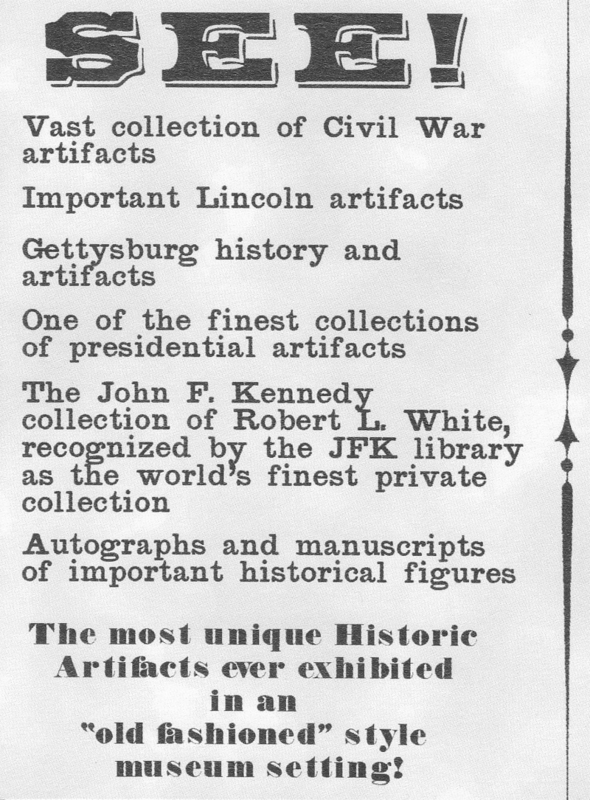 Paul Fay and his wife, Anita, prepared with a two-volume set of American Heritage’s Pictorial History of the Civil War. They studied all of Thursday evening, and again on Saturday morning. They felt that they were well prepared for the trip. Prominent monuments here include the Pennsylvania State Memorial on the left, Hexamer’s New Jersey Battery to the right of the Pennsylvania monument, and the First Minnesota in the background to the right of Hancock Avenue. This view was taken facing southeast at approximately 4:45 PM on Thursday, February 26, 2009. It seems that Secretary Fay got a little too overconfident with his newly acquired American Heritage knowledge of the Civil War and the Battle of Gettysburg, and attempted to play his version of “stump the guide” with Colonel Sheads. Colonel Sheads undoubtedly pointed out Father Corby’s statue on the left to the Irish Catholic President. Dow’s Maine Battery is on the right. This view was taken facing northeast at approximately 4:45 PM on Thursday, February 26, 2009. Sheads was probably giving a general tour for the first time visitors, and Fay would “challenge” Colonel Sheads for facts, and “demand clarification on every point.” Fay admitted that he became “obnoxious.” The George Weikert Farm is to the southwest of Ames New York Battery. This view was taken facing southwest at approximately 4:45 PM on Thursday, February 26, 2009. Finally, President Kennedy interrupted, “Professor Sheads, don’t hesitate to give us the facts. 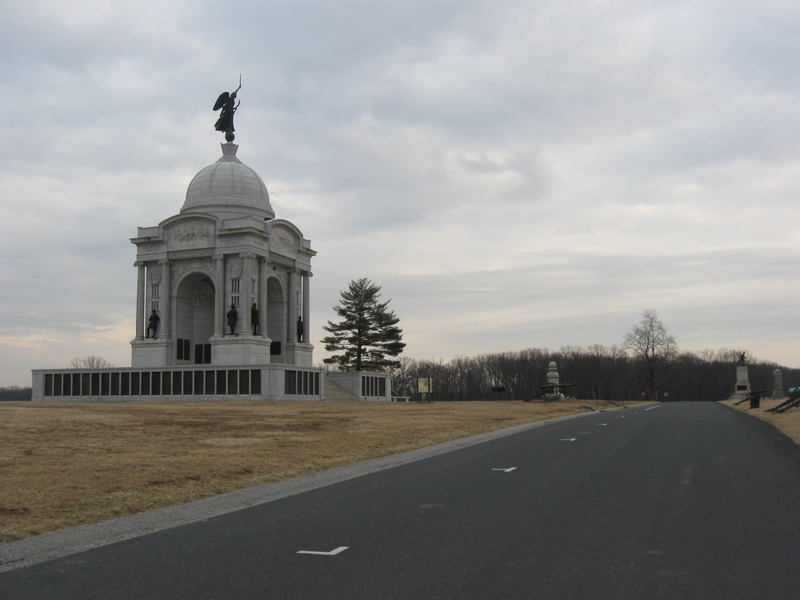 I happen to know the extent of Secretary Fay’s Civil War knowledge.” Without the ability to trip up Colonel Sheads, Fay said that for him, the tour became “miserable.” The John Sedgwick Equestrian statue is on the left as is the monument to the 10th Massachusetts Infantry Regiment. 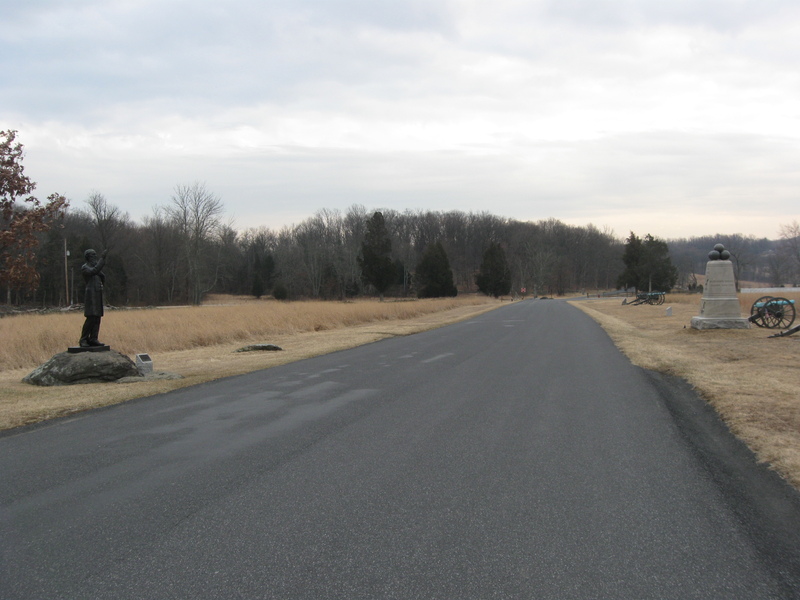 The monument to the 1st Massachusetts Cavalry is farther up the road on the left. This view was taken facing southeast at approximately 4:45 PM on Thursday, February 26, 2009. Secretary Fay was “fascinated” by the reactions of other visitors to the battlefield that day as the President and his party came close to them. The Kennedy party would have driven up Little Round Top from this direction. This view was taken facing northeast at approximately 4:45 PM on Thursday, February 26, 2009. Fay thought that the First Family was dressed informally (maybe for the Kennedys in 1962 this was informal), “and the Mercury convertible was not what you would normally expect a President of the United States to come driving up in…most people didn’t realize it was the President until they practically bumped into him.” This photograph was taken on West Confederate Avenue near the Virginia monument. The image is a good example of why, for safety reasons, Licensed Battlefield Guides prefer to drive visitors’ cars. What one doesn’t need is someone driving along with their eyes on everything but the road as you’re whizzing by cannon, trees, monuments, stone walls, other cars, etc…This view was taken facing northeast at approximately 1:00 PM on Sunday, March 31, 1963. 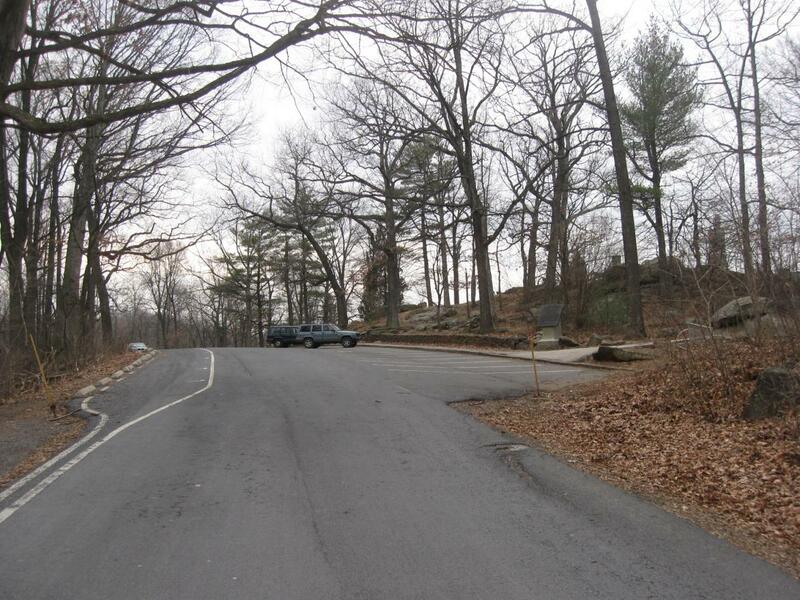 When the President and his party (two or three other cars behind him, depending on the source) reached Little Round Top, the parking lot would have been lined differently than it is now to park traffic coming from the north. This view was taken facing south at approximately 4:30 PM on Thursday, February 26, 2009. Of course we don’t know if they walked to the summit by taking this path… This view was taken facing northwest at approximately 4:30 PM on Thursday, February 26, 2009. 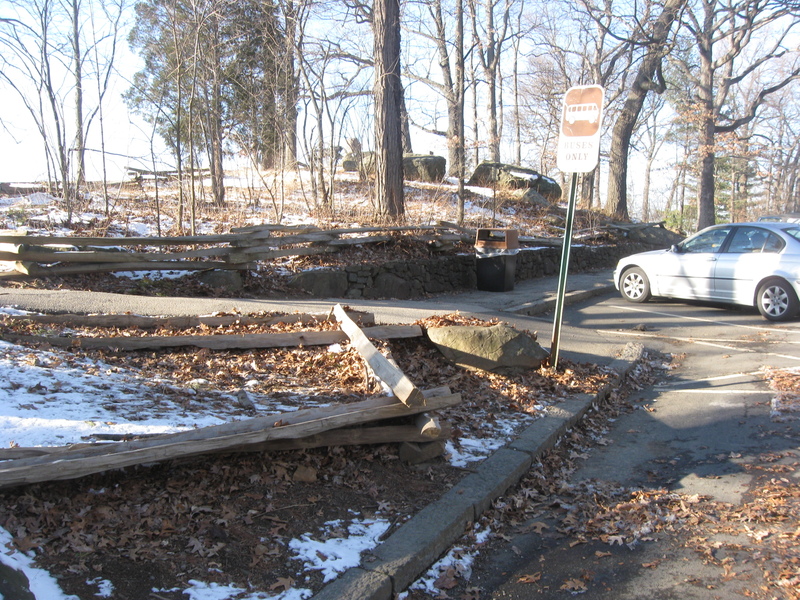 … or this path by the bus parking spot. Either way, President Kennedy, whom the Secret Service did not want to leave his vehicle, will exit it for the second time on the tour. This view was taken facing northwest at approximately 4:30 PM on Tuesday, March 3, 2009. It’s just pure conjecture, but let’s say that they took this path to the summit. This view was taken facing northwest at approximately 4:30 PM on Tuesday, March 3, 2009. We’re guessing it was this way because of the cannon by which Colonel Sheads chose to stand when he reached the top. By which of these four artillery pieces were they standing? This view was taken facing northwest at approximately 4:30 PM on Tuesday, March 3, 2009. 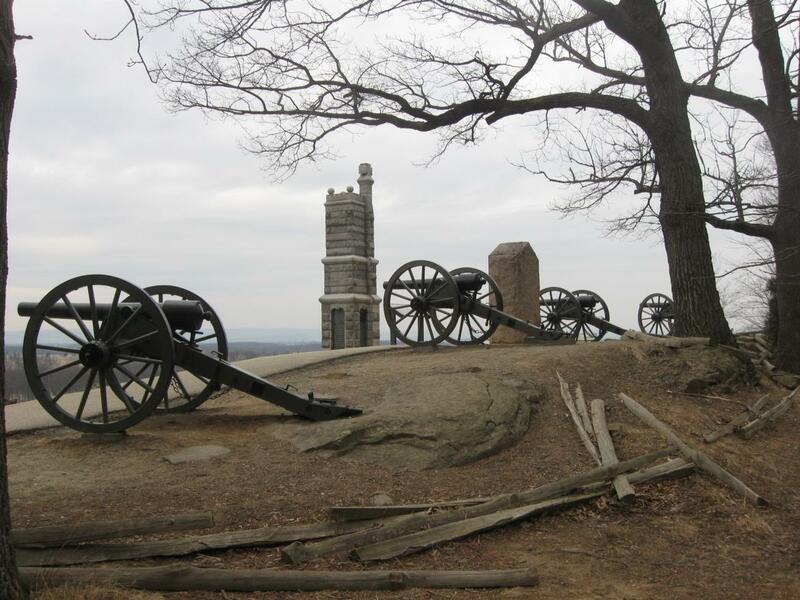 Let’s look at the original photograph from Little Round Top again. 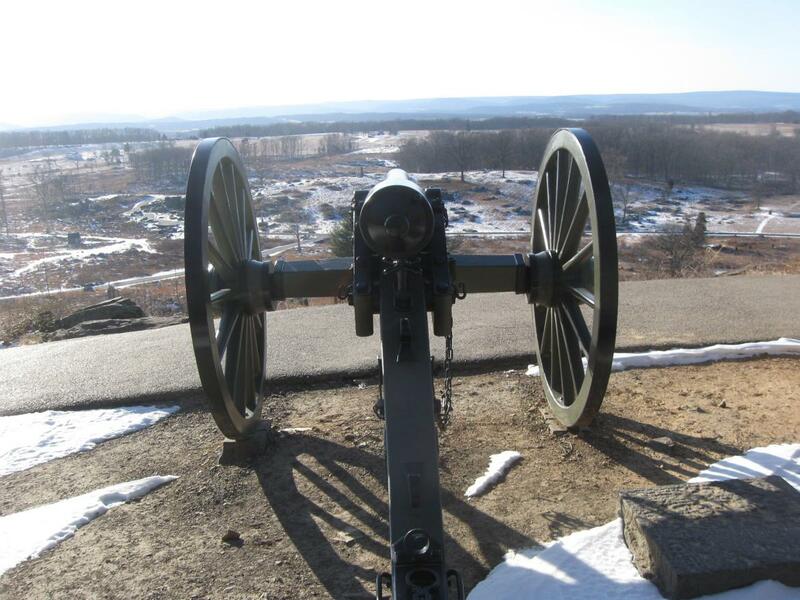 This cannon…This photograph is courtesy of Erik L. Dorr, the owner and curator of The Gettysburg Museum of History. This view was taken facing west at approximately 12:10 PM on Sunday, March 31, 1963. … is in the same position where this cannon is located. This is the first cannon that Colonel Sheads would have reached on the top of the hill if he came up the path from near the bus parking space. This view was taken facing west at approximately 4:30 PM on Tuesday, March 3, 2009. 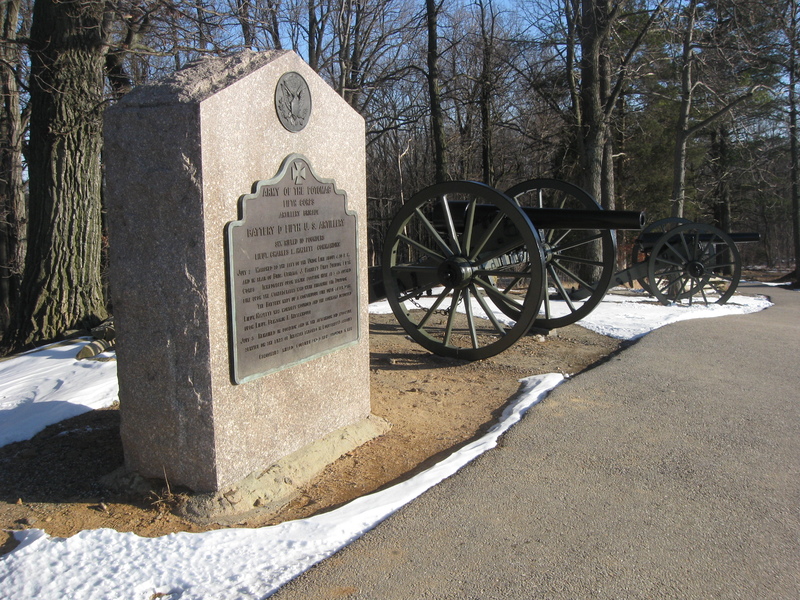 This cannon is on the right of (south of) the marker to Hazlett’s Battery. This view was taken facing southeast at approximately 4:30 PM on Tuesday, March 3, 2009. 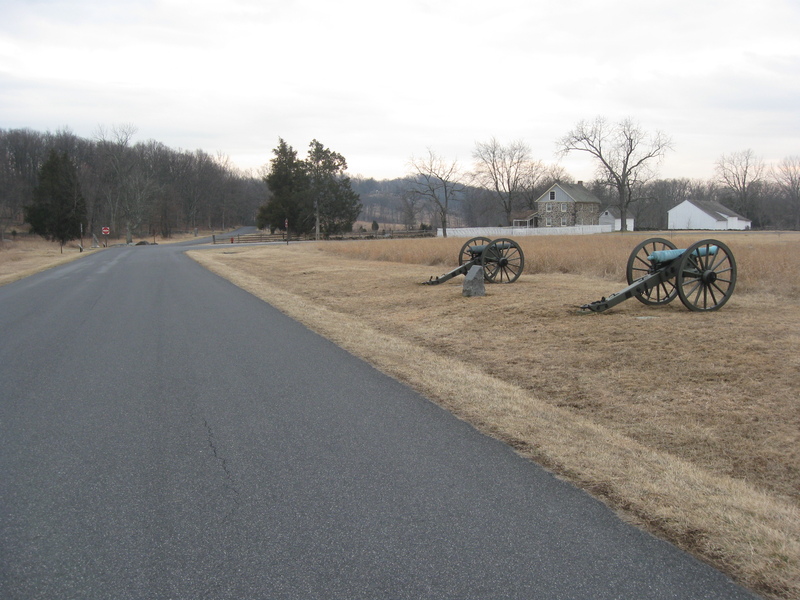 Hazlett was killed here on the afternoon of July 2, 1863, and Lieutenant Benjamin Rittenhouse commanded the battery for the rest of the battle. This view was taken facing southeast at approximately 4:30 PM on Tuesday, March 3, 2009. 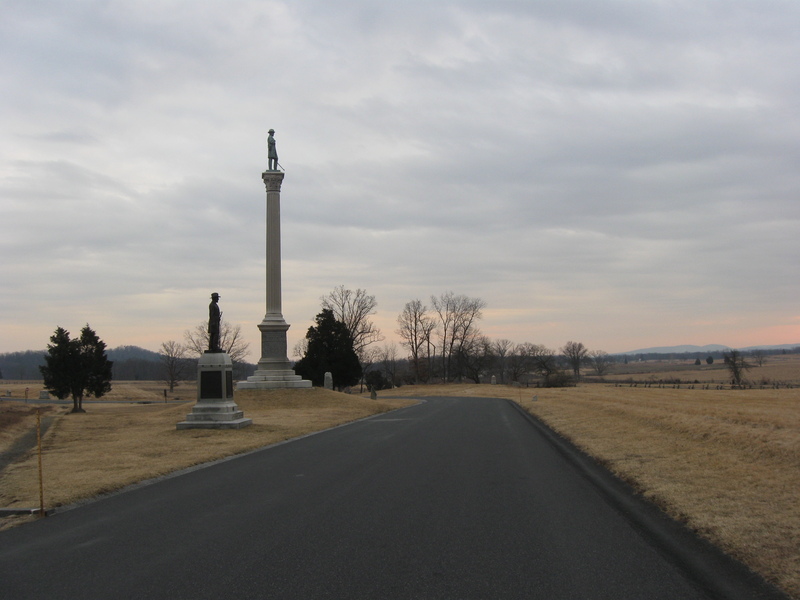 In Video #7, Gettysburg Licensed Battlefield Guide Rich Goedkoop, at another of Hazlett’s pieces, explains some of the events that Sheads probably described for President Kennedy from this spot. This view was taken facing west at approximately 4:30 PM on Saturday, February 14, 2009. In Video #8, Richard Goedkoop explains why Presidents visit Gettysburg. This view was taken facing west at approximately 4:30 PM on Saturday, February 14, 2009. The photograph of President Kennedy at Little Round Top was provided to us by Gettysburg resident and artifact collector Erik L. Dorr. 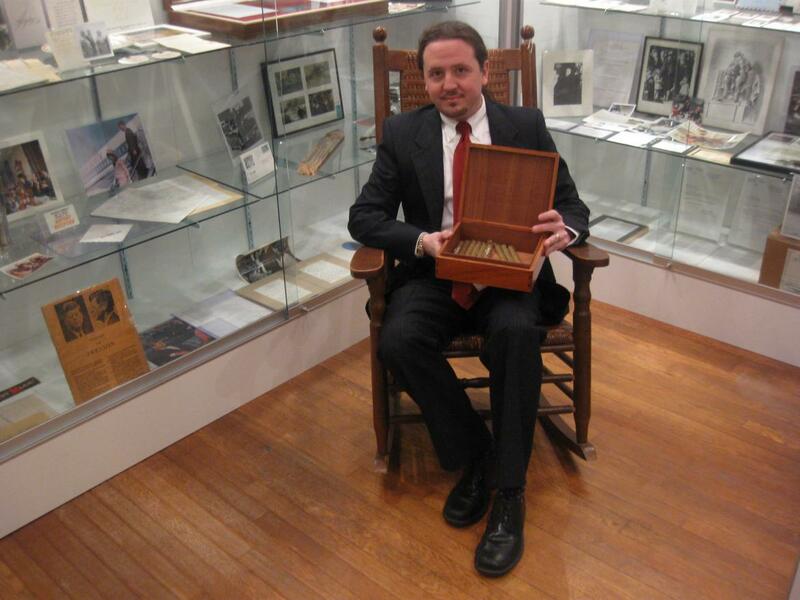 Erik is sitting in one of two rooms that he has filled with hundreds of items on display that are related to President Kennedy. 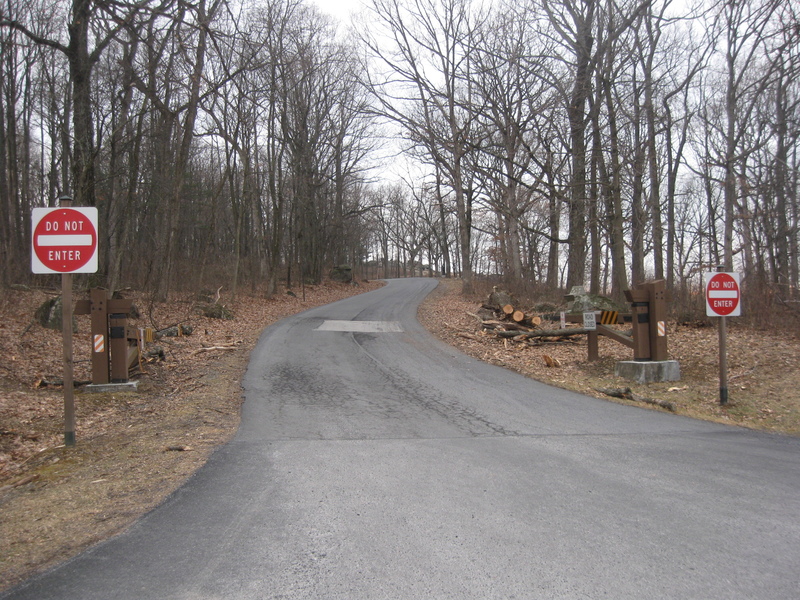 This view was taken facing southeast at approximately 4:45 PM on Monday, March 2, 2009. 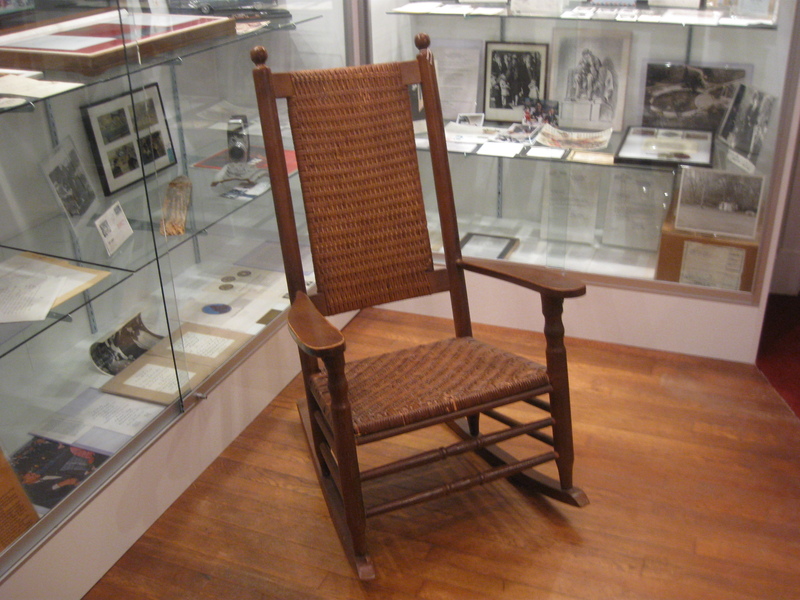 He was sitting in one of approximately a dozen rocking chairs that Kennedy owned. 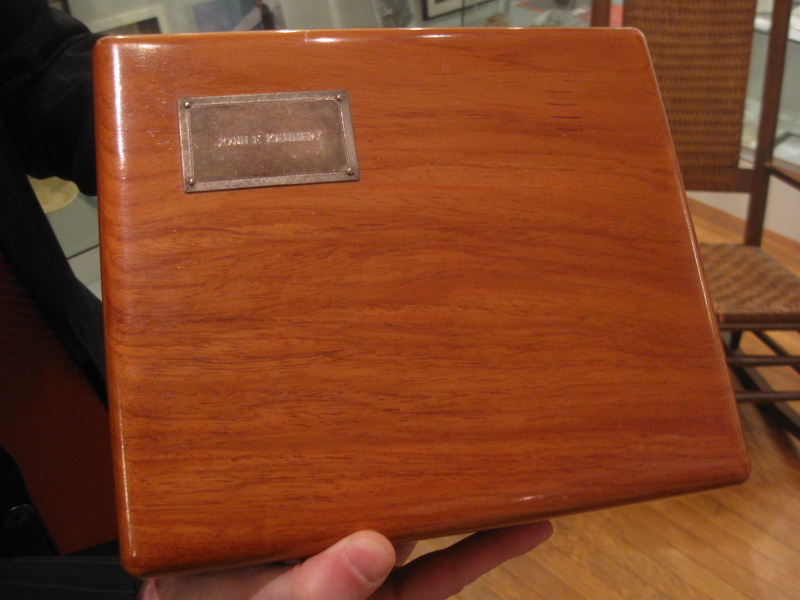 This one never made it to the White House, but was used by Kennedy in his Senate office. This view was taken facing southeast at approximately 4:45 PM on Monday, March 2, 2009. And the box that Erik was holding? It also belonged to President Kennedy. This view was taken facing southeast at approximately 4:30 PM on Tuesday, March 3, 2009. 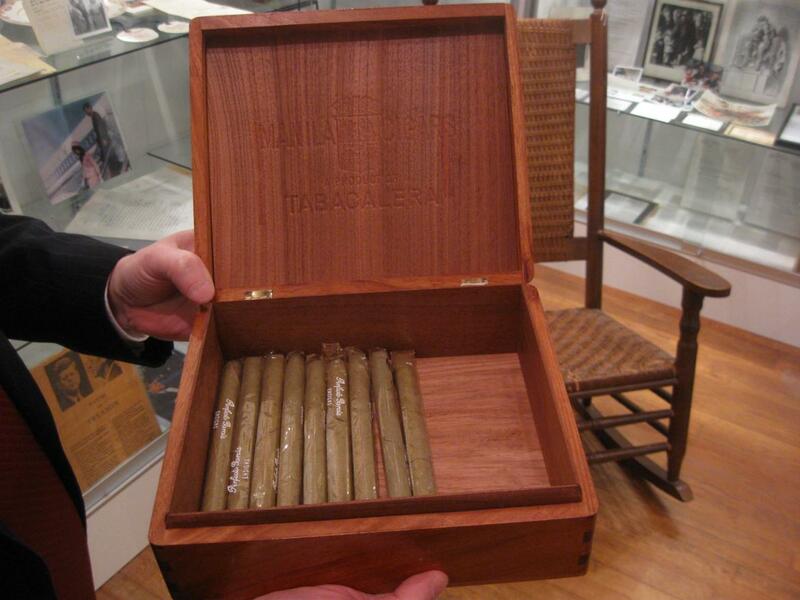 This humidor was in President Kennedy’s desk when he was assassinated, and these are the cigars that were in the humidor when it was removed from the White House on November 23, 1963. This view was taken facing southeast at approximately 4:30 PM on Tuesday, March 3, 2009. 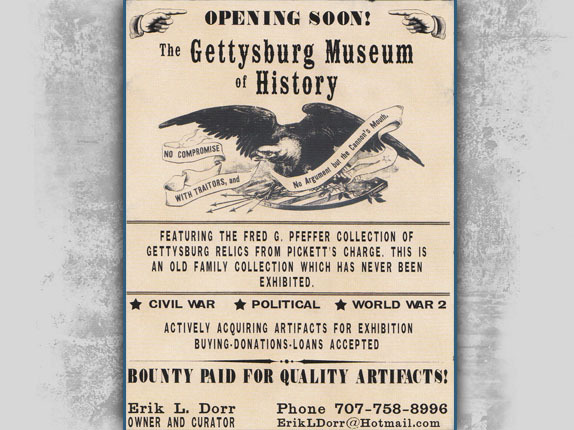 Erik is opening up Gettysburg’s latest museum this spring. On the card is some contact information if you would like to get in touch with him. This card was scanned facing south at approximately 5:15 PM on Monday, March 2, 2009. 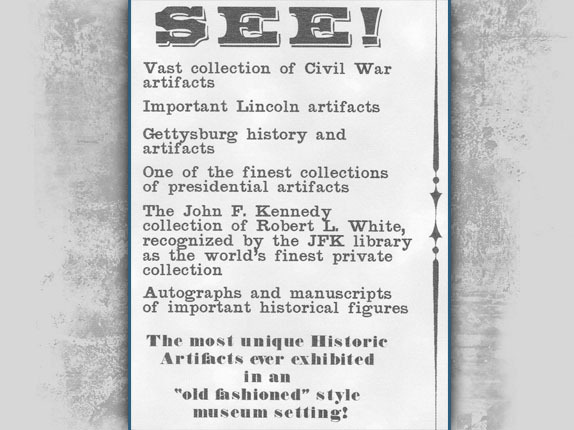 This museum, and we received a “sneak peak” this week, will be Gettysburg’s largest free museum. We are confident that you will find it as fascinating as we did. This card was scanned facing south at approximately 5:15 PM on Monday, March 2, 2009. Most of the black and white photographs of our series on the Kennedy visit were graciously supplied to us by one of Jacob Sheads’ sons, Tim Sheads. 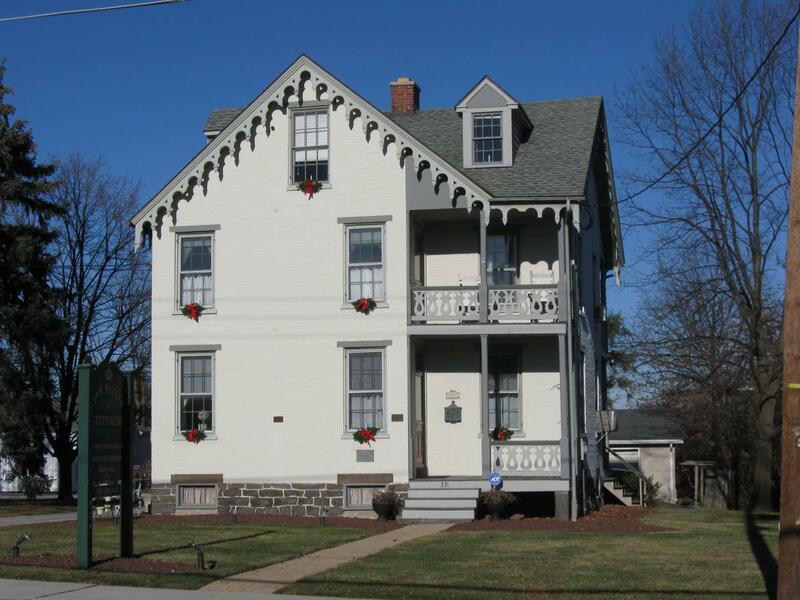 Tim and his wife Debbie own the Carrie Sheads House on Buford Avenue (the old Chambersburg Pike). 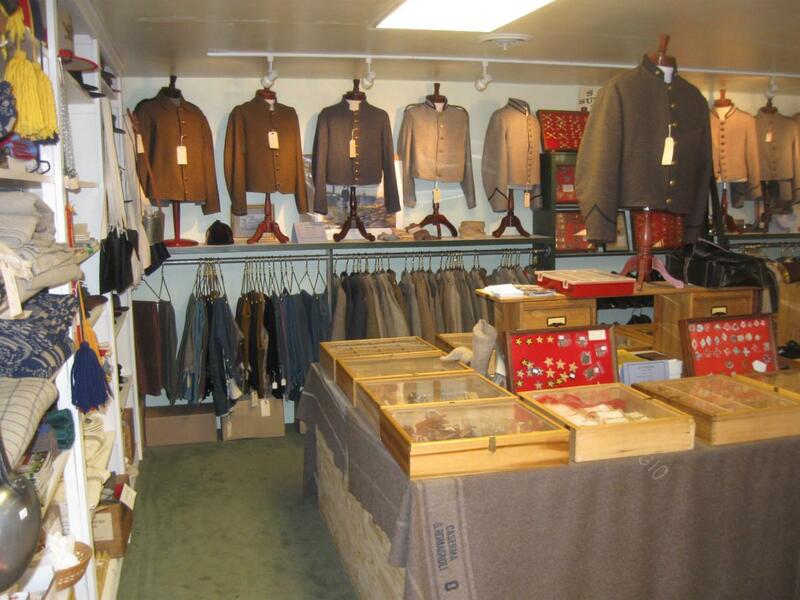 Please visit their store, S & S Sutler of Gettysburg, located behind the Carrie Sheads House at 331 Buford Ave Gettysburg, PA 17325. 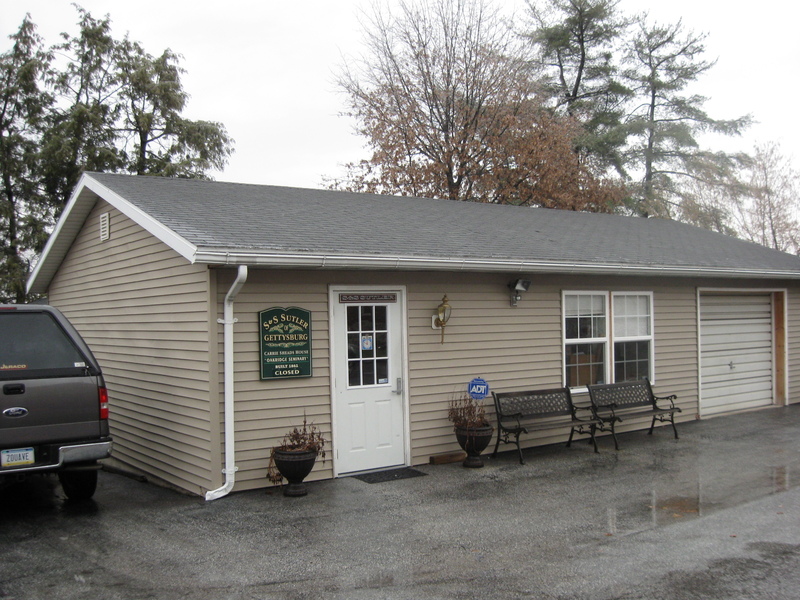 Their telephone number is 717-338-1990. S & S Sutler of Gettysburg is filled with items for reenactors and others who are interested in Civil War history. This photograph was taken facing northeast at approximately 2:00 PM on Sunday, February 15, 2009. Gettysburg Artillery with LBG George Newton here.